Every year, The Stevie Awards for Women in Business recognizes female business leaders from all over the globe who are making an impact. Improver Susan Fojtasek, VP of Consulting, had the honor of being recognized as a finalist for Maverick of the Year - Computer Software. This award is given to influential female leaders who have affected positive change on their company and industries. Susan is one out of only three finalists selected for this category. Susan's contributions to Improving and the Dallas technology community are numerous. She was one of the founding members of Improving back in 2007 and has since helped grow the company into what it is today. As an executive, Susan works directly with our CEO, Curtis Hite, to manage corporate strategic projects. Her portfolio of accomplishments are vast but her capital achievement at Improving has been leading 14 teams, containing nearly 500 IT personnel, through the merger of the world's largest airline company. Under her leadership, her teams were able to accelerate a strategic project in less than 16 months. Beyond Improving, Susan is also involved in the Dallas technology community. She speaks publicly and has helped establish professional groups throughout the Metroplex. This past year, she has been accepted to the Leadership Plano Class 35 partnered with The Plano Chamber of Commerce to further develop leadership skills and gain a broader perspective of different industries within the Plano community. On November 17th, finalists for the Stevie Awards for Women in Business were invited to attend the awards ceremony in New York to hear the final placements for the categories. 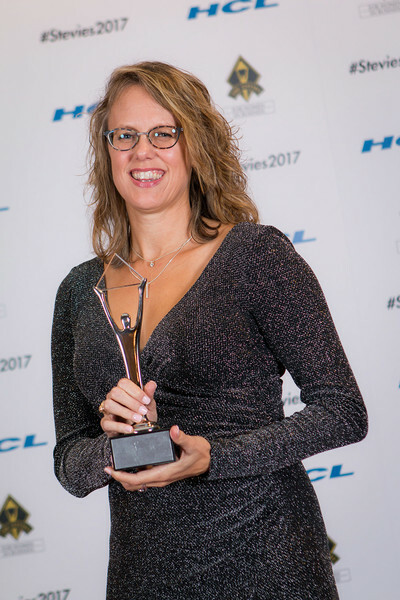 Susan was awarded the Silver Stevie for Maverick of the Year - Computer Software. We are very proud of Susan for being recognized for this well-deserved award. She is a cornerstone in the growth and success of Improving. Congratulations, Susan!